Happy Shrove Tuesday, or as the Estonians say, head vastlapäeva! I last blogged about this day a few years ago when we made pea soup, which is one of the foods traditionally eaten on this day in Estonia. 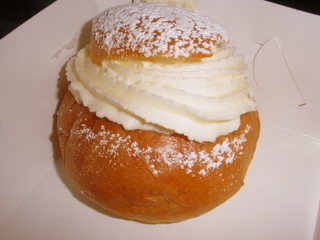 The other food associated with today is the vastlakukkel — a lightly sweetened yeast bun with the cap sliced off, topped with a hefty swirl of whipped cream and a dusting of powdered sugar. Some of them also contain jam under the whipped cream, like this one I picked up on the way home from choir rehearsal this evening. Yum. Christmas this year was a lovely success! Even though it was the first Christmas J’s family members and his brother’s girlfriend had ever spent away from home (it was #5 for me), there was enough joy, fun, and delicious food that everyone was as happy and comfortable as they would have been at home. While I had a little bit of stress as hostess, overall everything was casual and relaxed. We did some improvising to make everything work– we placed the kitchen table in the middle of the living room and extended it with a desk so there would be enough space for six people around it, plus we used disposal plates placed over actual dinner plates (a brilliant move in a place that doesn’t have a dishwasher). On Christmas Eve we ate a traditional Finnish Christmas dinner prepared by J’s mother and father, starting with the fish course, which I think I may enjoy more than the traditional Finnish Christmas kinkku (ham). Of course there was ham too, accompanied by all the traditional puree casseroles– carrot, potato, and rutabaga (the rutabaga is my favorite– it’s slightly sweetened with dark syrup). Dinner on Christmas Eve was followed by some clean-up, which I didn’t mind because when were at J’s house for Christmas his parents insisted on doing almost everything. This time cleaning up and washing the dishes was much more of a group effort, and I was happy that his parents were relieved of that burden this year. After-dinner clean-up was followed by an apple crisp with vanilla ice cream (I forgot to take a picture), opening gifts, plenty of wine, and even singing some Christmas songs (as her two sons refuse to join in any singing, I think J’s mother was thrilled that me and her other son’s girlfriend were more than happy to participate :-)). 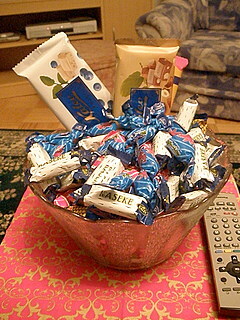 Can’t forget about Christmas candy! 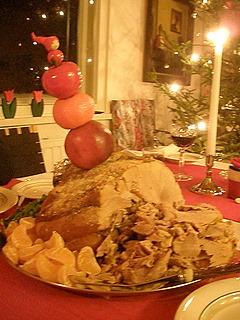 Christmas Day was definitely the most stressful day for me, as I was serving my first-ever Christmas dinner to a group of people who weren’t familiar with all the dishes being served, as it was supposed to be a traditional American holiday dinner. I remained mostly confident, but it was hard to silence some worries– what if the food doesn’t taste good? We all ate so much yesterday– what if nobody is hungry enough to eat my food? 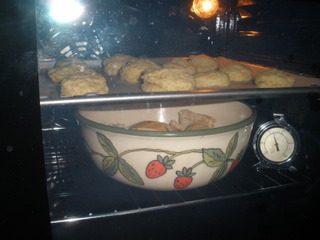 Biscuits baking and turkey in its serving dish. I made as many things in advance as possible. The buttermilk biscuits and pumpkin pie were waiting in the freezer, and I baked the mushroom stuffing in the morning before heading over to the apartment where J’s family was staying. While the stuffing baked I ran to the store in my pajamas to buy whipped cream– I couldn’t serve my pumpkin pie without whipped cream! Overall the plan I’d made worked out wonderfully (timing is one of the hardest things for me when it comes to making a meal, so I was pretty proud of myself!). J helped me with some of the trickier things– making sure the turkey was done, carving the meat, skimming the fat off the drippings, and making gravy. We were both so busy in the kitchen that there aren’t many pictures of our prep. I forgot to mention that I added something to the menu that I published the other day, or actually J added something. I mentioned that maybe the meal needed some kind of salad and he said, “How about cole slaw?” I loved the idea! Although cole slaw is kind of a summery salad, I felt it was a crispy, refreshing addition to the holiday meal (plus it’s so easy to make!). 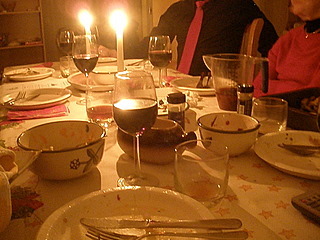 This post is getting really long, so I should just get to the point– my Finnish audience LOVED the American meal. I had made printed menus that included the name of each dish in English and in Finnish, which everyone seemed to like. J and I had made up some of the names, since the dishes don’t actually exist in Finnish (for example, stuffing was leipälaatikko). Everyone tried everything that was on the table, which is of course polite, but it was only when people started taking seconds that I was really convinced that they liked it ;-). The biggest hits were probably the stuffing and the cole slaw (I think those were my favorites too!). I was so pleased that my first holiday dinner attempt went so well, and I couldn’t have prepared it for a warmer and more receptive crowd :-). Plates have been emptied, glasses have been filled. 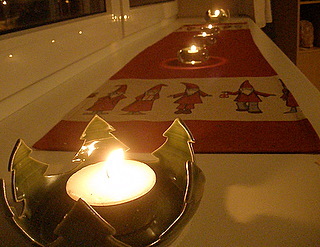 … and we are just starting our three days of Christmas feasts, featuring Finnish, American and Estonian Christmas specialties. I hope everyone has a safe, peaceful and enjoyable holiday. Eat, drink, and enjoy the company of those around you while also thinking about those who aren’t near you this Christmas. I know that’s what I’ll be doing. Merry Christmas! Häid jõulupühi! 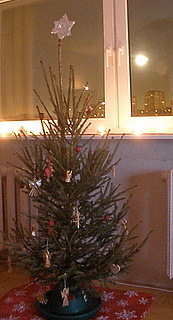 Hyvää joulua! 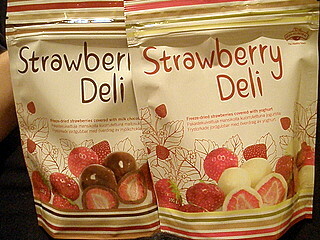 They’re freeze-dried strawberries covered in yogurt and chocolate. I didn’t even know such a thing existed, but I think they’re going to be amazing! I love that she saw the strawberries and thought of me :-). Later on that same evening she asked me where my whole strawberry obsession came from (she knows about the blog). I blushed a little, as I do when I’m put on the spot, and said I don’t really know. She asked if it’s a long-running thing and I said yes, that one of my grandfathers (who passed when I was very young) had called me “Marika Maasikas” and maybe it started from that. I’m still shy when talking about the blog, but at the same time it’s awesome that my future mother-in-law (feels so funny to type that!) knows about my blog, understands why I take lots of pictures of food, and tries to understand why I like the things I like. Even though we can’t converse on the level that I would like to (my spoken Finnish is very elementary), I feel that she “gets” me. She’s always asking me questions about myself, not just related to the blog or to food (although she knows that asking me any question about food will get me talking, regardless of my awkward Finnish! ), but about work, family, life in general. I can safely say that the mothers of some of my ex-boyfriends (with whom I was able to speak easily, in English) did not ask me as much about myself as J’s mother does. And that’s nice, those questions that let you know that somebody is interested and truly wants to know more about you. While it can get frustrating not being able to talk and express myself in the exact way I’d like to, sensing that J’s mother knows who I am (and likes me!) in spite of that feels really great. Roast turkey. Since both the Finnish and Estonian Christmas meals are very pork-heavy, I thought a bird would be a nice change of pace. I’ve never thawed and roasted a frozen turkey before, so wish me luck. 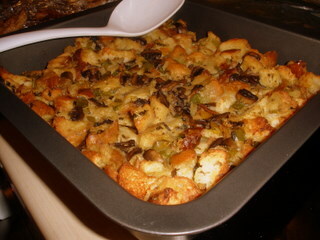 Stuffing. A very American side dish and I’m pretty sure J’s family has never tried anything like it. I can’t put any onions in it since somebody is allergic, but I’ll be adding mushrooms to give it some good depth of flavor. 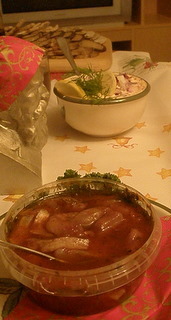 Cranberry sauce. They sell Ocean Spray canned cranberry sauce at the Stockmann department store. A few months ago they also had whole cranberries, but I haven’t seen those recently. If I find the whole berries, I’ll of course make the sauce from scratch. Buttermilk biscuits. So proud of myself for coming up with this idea! I made a test batch this week using this recipe and while the texture was perfect, J pointed out that the soda taste was a bit strong and came across as quite bitter. I need to try another recipe… any recommendations? Roasted Brussels sprouts. Because I need to get some veggies in there somewhere! Pumpkin pie with whipped cream. 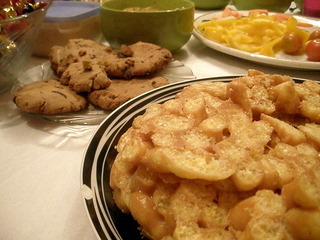 Nice traditional holiday dessert that I hope will be amazing made with my very own pumpkin puree. Snacks before or after dinner. I was also thinking of putting out cut veggies with dip and hummus as an appetizer, I have a bag of Pretzel M&M’s I’d love to share, and there’s chocolate chip cookie dough in the freezer in case I decide that it would be fun to have those too. 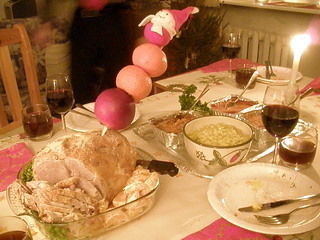 Appetizers from Christmas with my family three years ago in Tallinn. So there you have it! A menu that I think will introduce some features of American holiday cuisine to our guests without being too exotic (I am sort of wondering how they’ll react to a “casserole” made mostly of bread cubes!). I’ve also worked out most of the logistics already, and if I get enough prep work done this meal should be pretty easy to pull off on the 25th. Can’t wait for next week! Today I’d just like to wish a happy Thanksgiving to all the readers in America! I hope you arrive at your destination safely and have a wonderful time with family and friends (and a fun four-day weekend!!). In Estonia, today is just Thursday. The only special event J and I could be celebrating is Marika’s First Root Canal, which took place this afternoon (and it honestly wasn’t bad at all… why do people talk about root canals like they’re really scary?). Anyway… have a lovely holiday! He looked great in his plaid shirt, bib overalls (both purchased for super cheap from a secondhand store) and Coors Light cap. 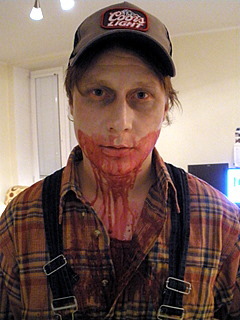 He even won the prize for best costume at the party we attended. 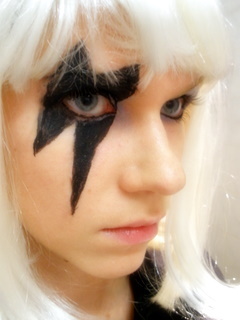 Unfortunately, with my all-black outfit and extreme black eye makeup I ended up looking more like the lost female member of Kiss than Lady Gaga :-D. I think my outfit was lacking Gaga’s truly insane style, but that’s OK. I still had fun doing my makeup and wearing fake lashes for the first time ever! 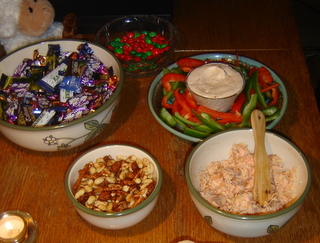 There was plenty of fun food at the party to help us get our requisite Halloween sugar high. In the foreground is the snack I made– Kass Arturi kook, which is sort of the Estonian equivalent of rice crispy treats. They’re made by stirring plain corn-based puffs into melted butter and caramel, the shaping the whole mess into a log and cutting it into slices. Somebody else made the chocolate chips cookies, and if you look all the way in the back, you’ll see that we had some veggies too. Popcorn balls! (Except they all kind of melted together into one giant mass). 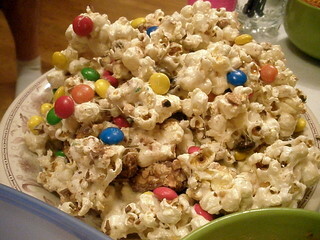 Popcorn with marshmallow, M&M’s and chopped-up Snickers. So chewy and good. 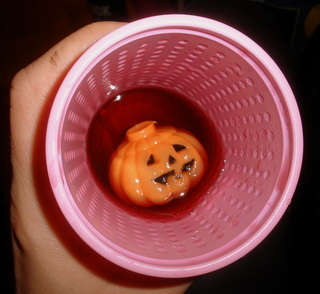 There was also a spooky punch bowl filled with Halloween-themed toys. Definitely a successful Halloween party! We had a great time hanging out with our friends (who last night included a witch, a Scotsman, a pirate, Ugly Betty, and a mime :-)). As it is the last day of October, it means that National Blog Posting Month– otherwise known as NaBloPoMo– starts tomorrow. I have tried to complete a month of daily blogging twice already and both times (!) messed up because of the same stupid error: failing to hit “publish”. After the second time this happened I was so frustrated, so I hope my brain doesn’t fail me again this year. I’ve been wanting to make some changes to the blog anyway, so hopefully this month of blogging will give me the motivation to carry out those changes.